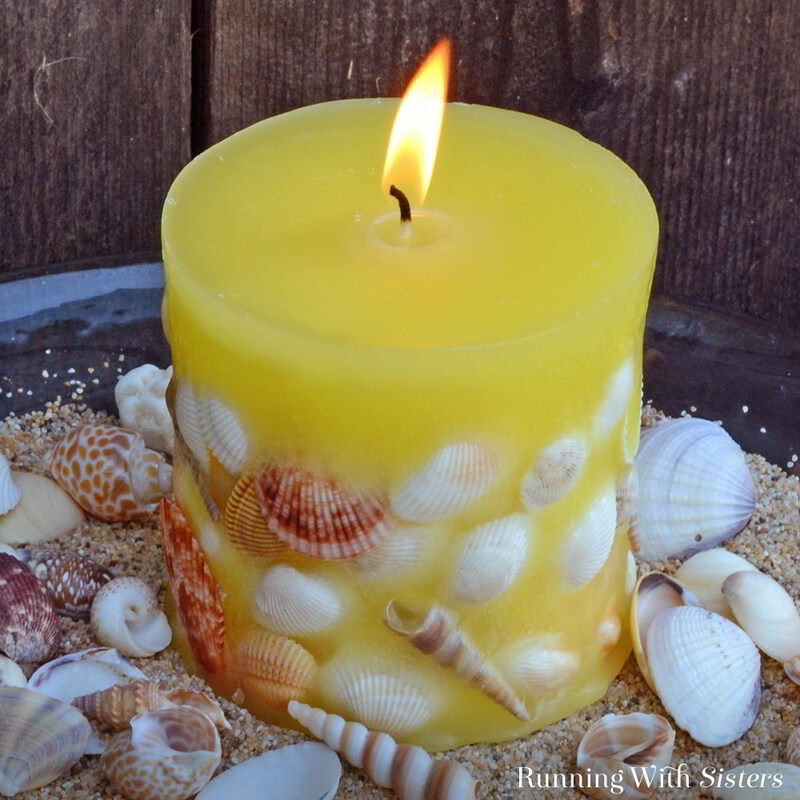 We love candles and we love shell crafts, so we had to make our own seashell candles. We see designer candles like these at Pottery Barn and Crate & Barrel. But they are spendy! 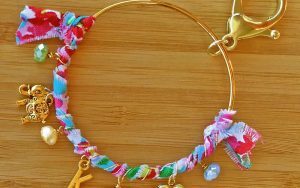 Besides, it’s more fun when you make it yourself! These candles are so pretty and it turns out, with the right set of molds, they are not any harder to make than a pillar candle. In fact, the first half of the craft is the same as making a pillar candle. 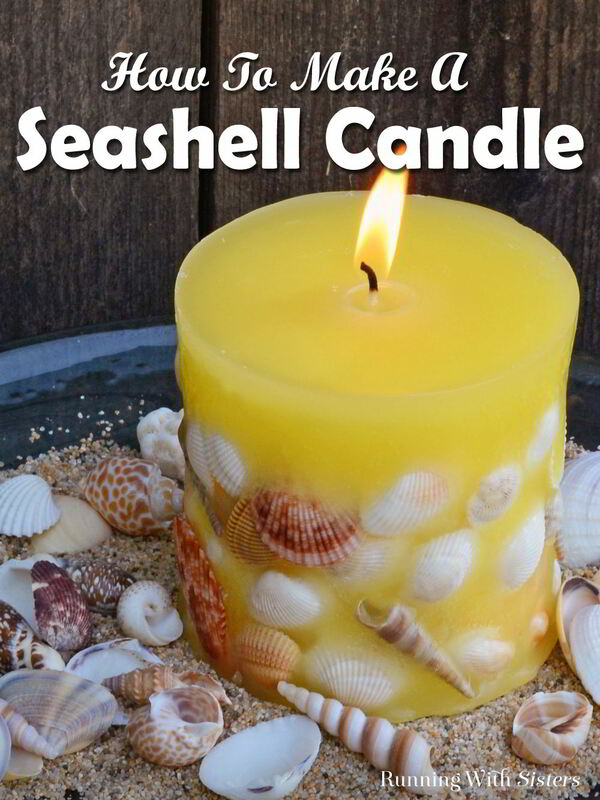 The only difference is that you set the pillar candle inside a larger mold, add shells and pour on more wax. We’ll show you how. And if you have any comments or questions, just write them in the comments and we will reply. We are always here to help! Cover the top edges of each mold with small pieces of masking tape to cover sharp edges. Feed the wicking through the hole at bottom of the smaller core mold leaving about three inches of wick sticking out the bottom. Coil the end of the wick. Roll the mold sealer into a ball and press it over the coiled wick to seal the bottom of the mold. 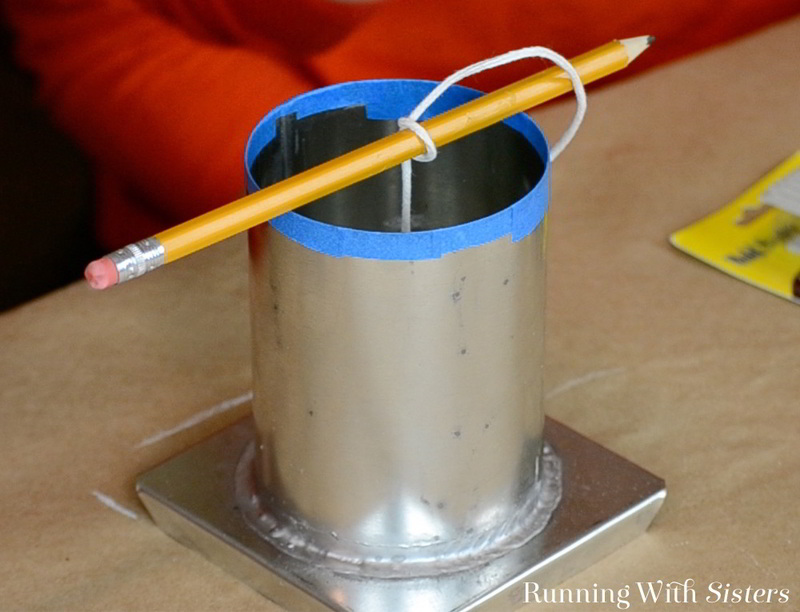 Tie other end of the wick to a pencil and prop it across the top of the mold. Trim off excess wicking. 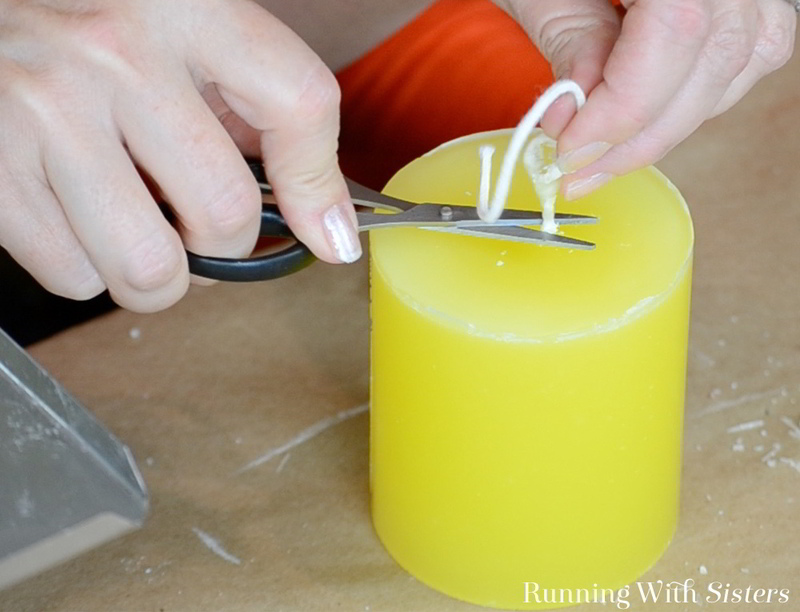 Cut the wax into small chunks using the chisel, hammer, and cutting board. 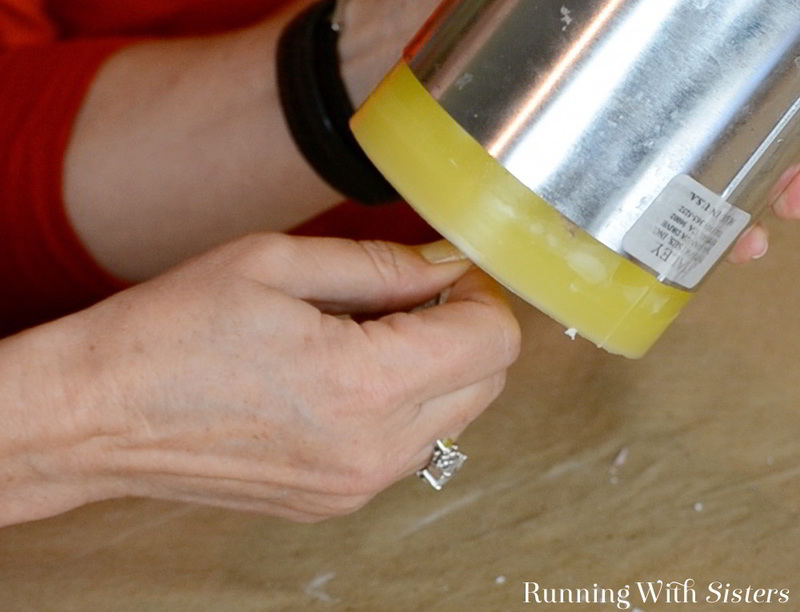 Weigh out the wax for the volume of the mold you are using, then add 4 ounces for spillage and shrinkage. (Our mold holds 25 ounces of wax.) Melt the wax to 210°F. Add 1 tablespoon of translucent additive. Shave a few carrot curls of color off the dye block onto the index card using the potato peeler. Add the shavings to the melted wax and stir. Test the color by dripping a few drops onto an index card. 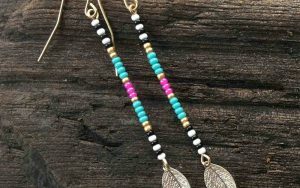 Add more color if desired. 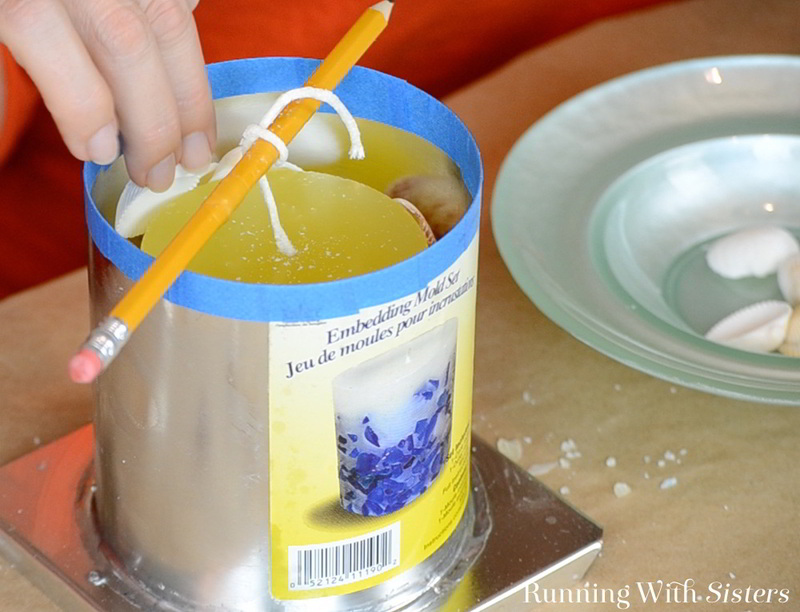 Add one tablespoon of liquid candle scent to the wax. Pour the wax into the mold and recenter the wick. Let the candle cool for one hour. 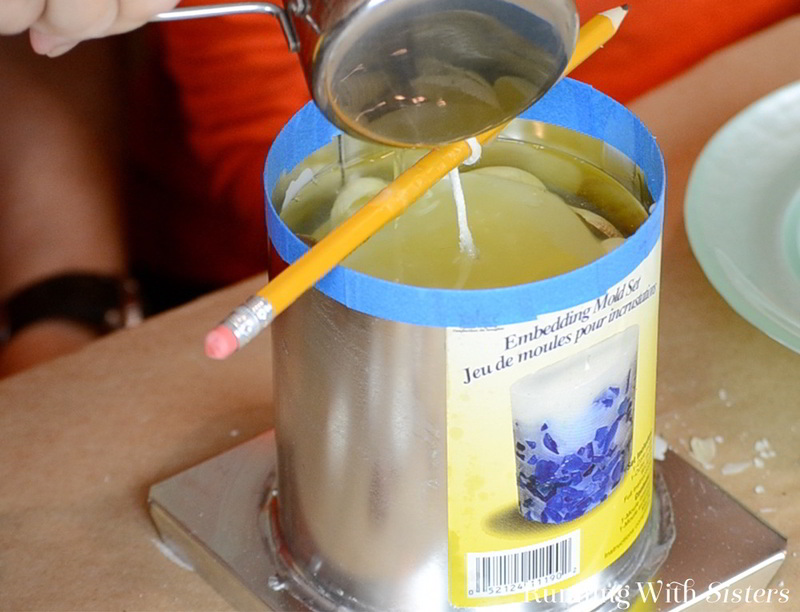 Use the skewer to poke four or five holes in the candle near the wick all the way to the bottom of the mold. 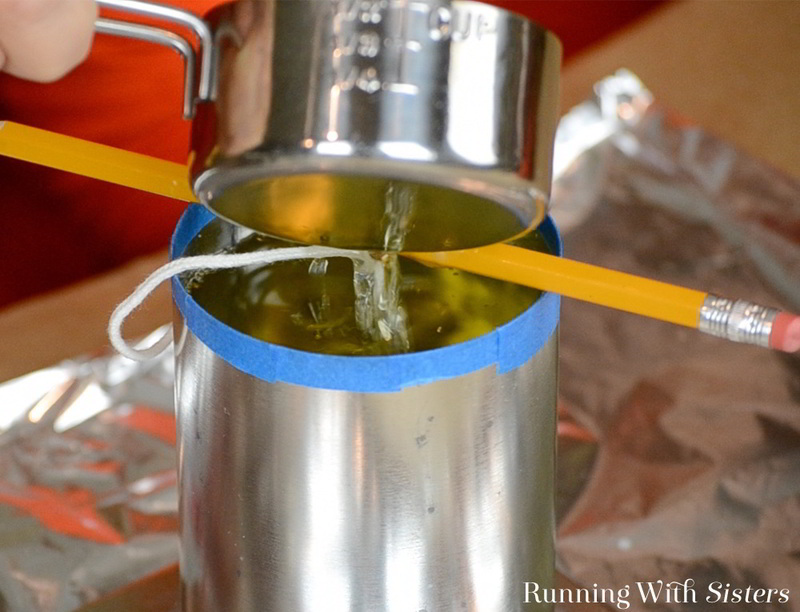 Reheat the wax and refill the candle up to but not over the original fill line. Let cool and repeat if another well forms. Let the candle cool completely for about 12 hours. Remove the masking tape from the mold edge. Remove the pencil and turn the mold over. Remove the mold sealer. Let the candle slide out of the mold. (If it doesn’t slide out easily, place it in the refrigerator for ten minutes and try again.) Turn the candle over – the bottom is the top. Trim the bottom wick flush. Seal the hole in the bottom of the outer mold with mold sealer. Set the core candle in the outer mold. Tie the end of the wick to a pencil and prop it across the top of the mold. Slide shells into the gap between the core candle and the outer mold. Remelt the wax to 200-210°F. Pour the wax into the mold until it covers all shells, fills outer mold, and has a layer over the top of the inner core candle. Wait 30 minutes and reheat the wax. Repour over the shells where wax has shrunken. Repeat if needed. 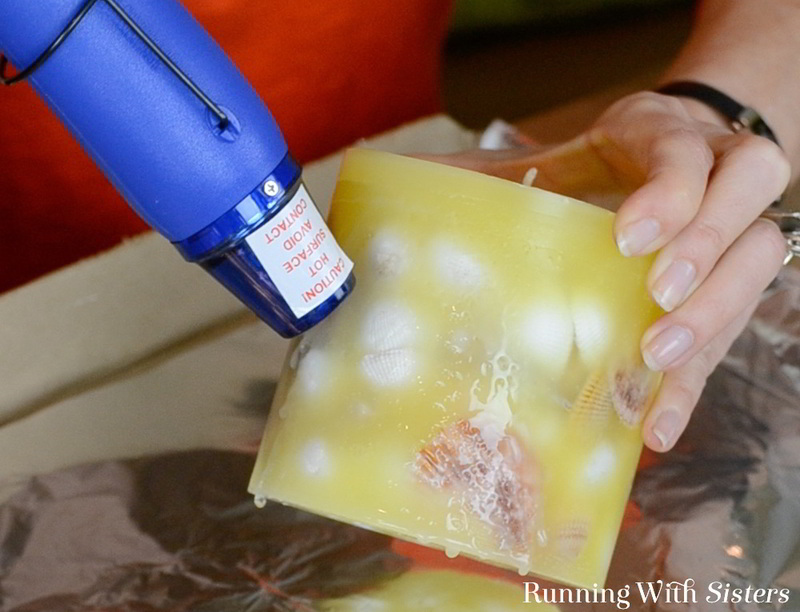 Use the heat gun to melt the top half-inch of wax in the mold. Let the candle cool completely overnight. Remove the masking tape from the mold edge. Remove the pencil and turn the mold over. Remove the mold sealer. Let the candle slide out of the mold. (If it doesn’t slide out easily, place it in the refrigerator for ten minutes and try again.) Trim the wick to 1/4″. 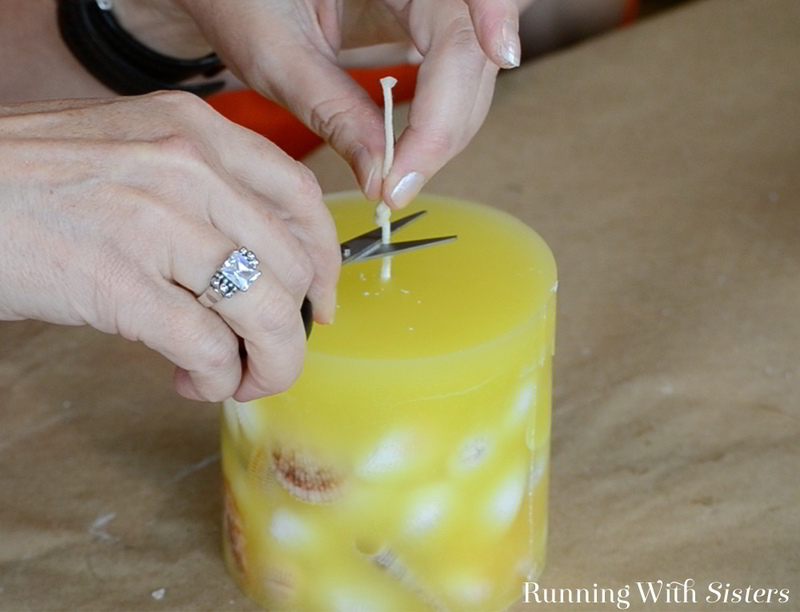 Use the heat gun to melt away some wax from the sides to reveal the shells. 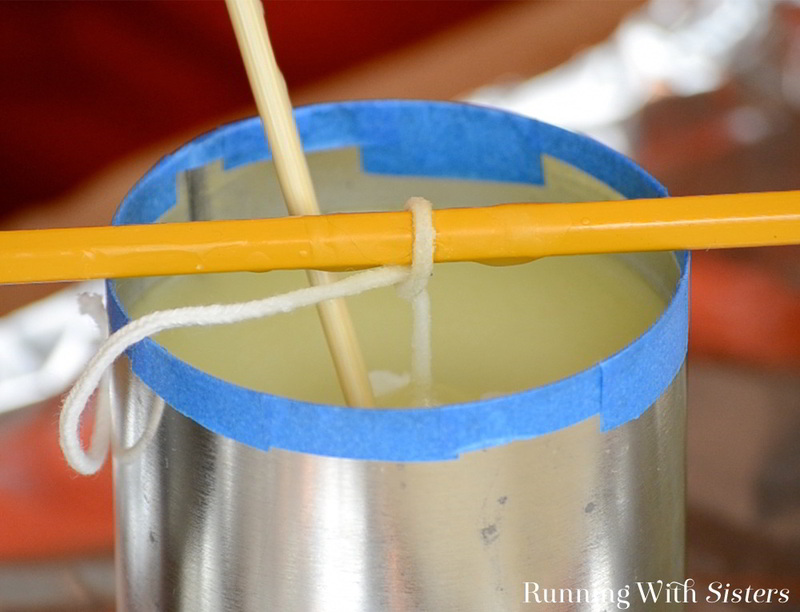 Have you ever tried making your own candles? If you want to get started, we have a whole course on candle making on Curious which includes a lesson for this candle. Click here to get a discount when you sign up for our classes. It’s so fun! 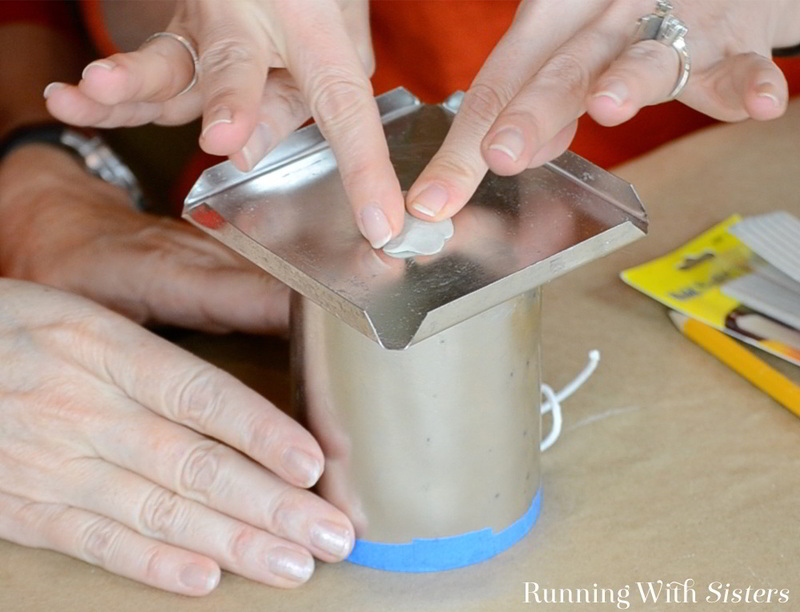 We don’t have a candle making book yet, but we have lots of how-tos here on the blog and videos too! We even have a course on Curious.com. We have a few candle making projects as PDFs we will send you in an email too. I want to try this but had one question. I am curious to know more about the additive “Yaley Translucent crystals additive”. Does this help the candle retain it’s shape with the shells? 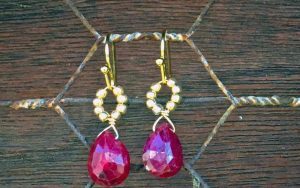 Hi Tim, The Translucent Crystals Additive makes the wax a little more see-through so you can see the shells through the wax. Without it, the wax can be a little opaque or cloudy. Hope that helps! where do you buy your supplies such as your molds, colored wax, scented oil, boiler and heat gun? I have a huge box of wax but its in bags grated and a big metal pitched to melt it in so how would I use that versus a boiler? I do also have some blocks of colored wax and wicks. I have not ever made candles but always like to try something new. One craft I never tried believe it or not. I did not know you had to use certain scented oils as I have never made them before, I just assumed you used essential oils which I have, lol. I would like to take your class this would be fun, but would rather gather supplies first why I am asking. 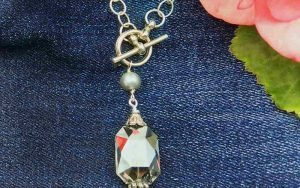 Hopefully I can get them online easily and affordably, as I am in process of launching my own blog soon and money is supposed to be limited for now. Not sure how I will do but have been procrastinating for the last year and time I put it in motion and quit worrying. Love your site, you two are quite creative. Look forward to taking your class and hearing back from you…thanks! Hi Mary! So glad you found us! We get a lot of our candle making supplies from Yaley.com. Amazon also carries Yaley’s brand. We know Tom Yaley and he was very helpful–answering questions and so forth–when we were putting together our course in candle making on Curious.com. You can use the big metal pitcher to melt your wax. Just set it in a pot of boiling water kind of like a double boiler. Let us know when you launch your blog! This is absolutely beautiful! I came across with your seashell & seaglass candles tutorial on youtube. You two are amazing and provide very detailed explanation! I bought the embedding molds from Yaley right after watching your video. 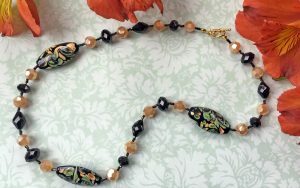 I wonder if I can replace the embedment with dried flowers and plants? How can I make sure the embedment wont get into the burn area and catch a fire while lighting the candle? Thanks! I would like to know how to make marbled candles. Can you help?